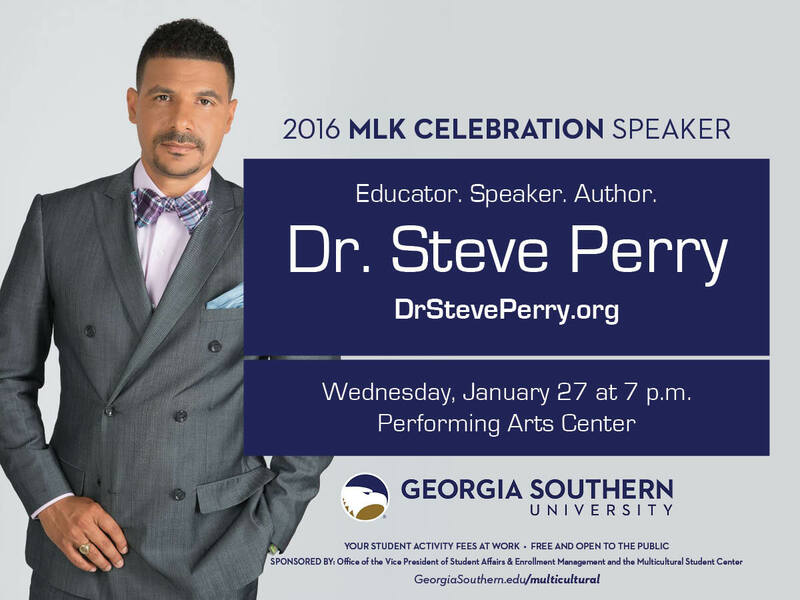 Georgia Southern will welcome Dr. Steve Perry, founder and principal of Capital Preparatory Magnet School in Hartford, Connecticut, to campus for the University’s 2016 MLK Celebration on Wednesday, Jan. 27, at 7 p.m. in the Performing Arts Center, 847 Plant Drive, Statesboro. Perry was featured in CNN’s Black in America series, and is the most talked about, innovative educator on the scene today. As the principal of Capital Prep, Perry has seen 100 percent of the predominantly low-income, minority, first generation high school graduates go on to attend four-year colleges every year since its first class graduated in 2006. Perry also is a strong advocate of personal and civic responsibility in all aspects of life. He emphasizes the social issues that aim at building up both the individual and the community so the next generation can be better contributing members of society. The annual celebration to commemorate the birthday of Dr. Martin Luther King Jr., is sponsored by the Office of the Vice President for Student Affairs and Enrollment Management, and the University’s Multicultural Student Center. Visit www.DrStevePerry.org.